I've been playing Madden NFL football games since the age of the Sega Genesis. Every year the same question comes up around mid-July, do I pick up Madden this year? I'll admit more times than not I try to avoid picking it up, saying it won't be that different, it won't be worth the money. I'll also admit most times I end up picking it up anyway and do end up enjoying it for a bit, until I start cursing it out. This year was a bit different though, this year I knew I'd pick up the game without any deliberation. Why? This year's Madden promised to do something different for co-op gamers by providing an online cooperative mode to the game. But wait you say, you could always play Madden in a co-op mode. This is true to a degree. Every year Madden games add some buzz words to their back of the box descriptions to tout new features. This year it's the Pro-Tak animation system which yields realistic tackles with multiple players. There's also a new Fight for the Fumble option which adds quick time events to recovering a fumble in a pile. The one thing I think most Madden vets will notice is the addition of 1000 new player animations - gone, finally, is that hokey running animation of the past four or five years. For online gamers, Madden NFL 2010 supports online franchises for a full 32 teams, live drafts, and integration with the official website. There's even an iPhone application that extends the franchise and allows you to manage things on the go. You'll also get weekly roster updates, which we've already seen, with additions of Bret Favre and Michael Vick. 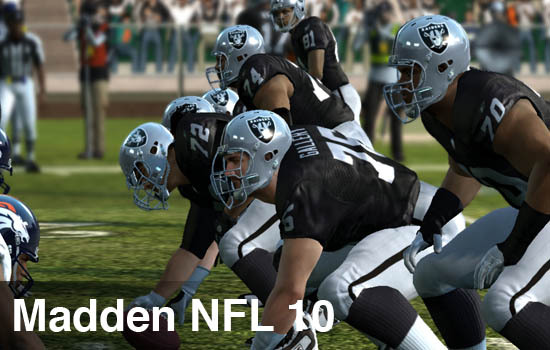 All in all there's almost 100 bullet points of new features and improvements in Madden NFL 2010. Not bad for a years worth of work. Most Madden games have allowed players to team up against the computer locally in couch co-op. Very few Madden games have allowed players to play this method online. 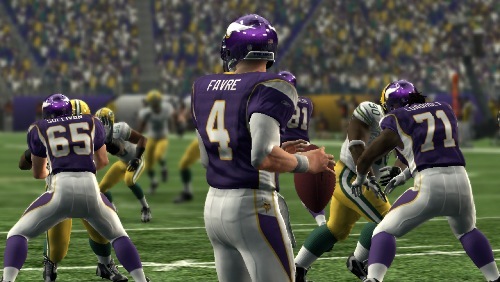 Madden NFL 2010 represents the starts of the team's effort to bring a true cooperative experience to the game, and it does this in a few unique ways. The two player online co-op mode has the host as the main play caller, and primary controller. He or she is in charge of choosing the plays, hiking the ball, and managing time outs. Think of him like the head coach that just so happens to play quarterback. That's not to say the second player is completely idle, they do have a role between plays. Player 2 will be presented with the past few plays chosen and the results of the play, either positive or negative yards. He'll want to communicate to the play caller what was effective or not effective, essentially acting like an Offensive or Defensive Coordinator. Once a play is picked but player one, it'll pop up on player two's screen and it's onto the field.